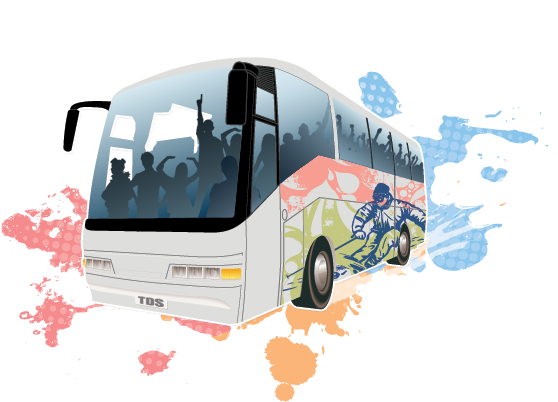 Meet your Family & Friends at your Bus Departure location and start your weekend!! Arrive at your Destination and breeze to your room with Pre-Registered Check in for all guests. Obtain your Activitiy Wristbands and Sign up for Saturday Activities at the official Tours de Sport Desk. Hit the FRIDAY NIGHT WELCOME RECEPTION complete with Make Your Own Taco Bars, Deli Platters, Veggies, Munchies and of course something Sweet to finish it off! 10:00 PM - 2:00 AM ......... "JAMMIN' JAMMI" DJ Dance Party with FREE OPEN BAR - Dress up or down in your PJs. Best male & female Pajama Contest with prizes. 7:30 - 9:30 AM ......... "All You Can Eat" Buffet breakfast served in the Grand Ballroom. 8:30 - 9:30 AM ......... Buses to SKI RESORT depart as they fill. 1:00 PM .................... "Mid-Afternoon" shuttle bus departs for the HOTEL. 3:00 & 5:00 PM ....... Buses depart for the HOTEL from SKI RESORT at these times. 5:30 - 6:30 PM ......... Tour Desk Open to sign up for Sunday Activities. 6:00 - 8:00 PM ......... "All You Can Eat" Buffet dinner served in the Grand Ballroom. 10:00 PM - 2:00 AM .............. TDS "Theme Party" featuring FREE OPEN BAR. Dance the night away to your favorite music. Compete for prizes in our "Adults Only" games. 8:00 - 10:00 AM ....... "All You Can Eat" Buffet breakfast served in the Grand Ballroom. 8:30 - 9:30 AM ......... Lift tickets on sale at the Tour Desk. 9:30 AM .................... Ski Area buses depart. 1:30 & 3:00 PM ....... Buses depart for the HOTEL from Ski Area at these times. 1:30 - 3:30 PM ....................... "FAREWELL" HAPPY HOUR PARTY featuring FREE OPEN BAR including hot and cold appetizers. 3:00 PM .................... Check Out time. 4:00 - 5:00 PM ......... "All You Can Eat" Buffet dinner served in the Grand Ballroom. 5:00 PM .................... Board buses for departure home. * Tour inclusions may differ at each tour. Shuttle and event times are example only. Please refer to your specific tour page for details.